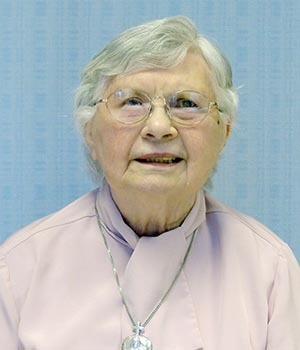 In honor and celebration of Sister Susanna we tell her story. They who trust in God will understand the truth, those who are faithful will live with God in love; for grace and mercy await those God has chosen. 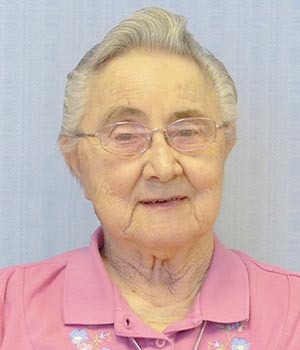 Her mother supported her desire to enter religious life, although she would have preferred that she enter the Mercy Sisters so she could stay in the San Francisco area. Anna may have wanted to stay in San Francisco because she loved San Francisco, the Bay and the beauty and energy of the water. However, her mother told her to go where she felt God was calling her. 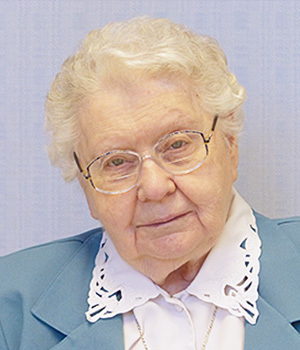 Anna entered the Congregation on January 29, 1944, then received the habit and name Sister Mary Susanna on August 15, 1944. 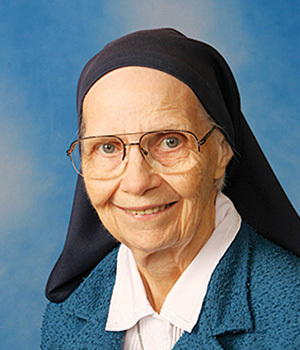 She made her initial profession of vows on August 15, 1946 and perpetual profession on August 15, 1949. 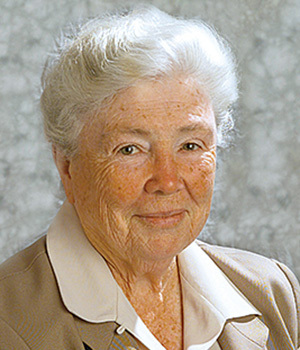 Sister Susanna’s first assignment was taking charge of the boys at Kearns–Saint Ann Orphanage in Salt Lake City, Utah. 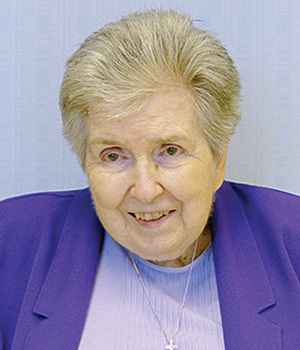 Sister M. Timothea (Kingston), was a child herself at Saint Ann’s when she first came under Susanna’s care. Timothea says Susanna loved children and was loved in return by them. Many of those children were being raised by a single parent, usually their mothers, so she understood their needs and behaviors quite well. After four years at Saint Ann Orphanage, Susanna was assigned to teach in the primary grades at Saint Joseph Catholic School in Ogden, Utah. 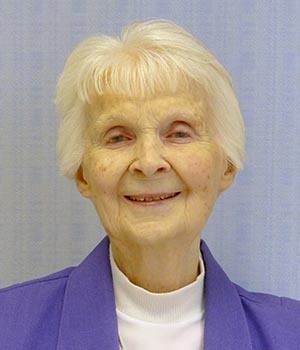 The love, care and understanding she had learned from her own mother and had given to the children at the orphanage, was always with her in the classrooms and on the playgrounds of parochial schools in Utah, California, Idaho, and Nevada during 30 years of teaching. When she moved out of classroom teaching, she was assigned to parish ministry for a year and then was a volunteer tutor in California at St. Pius School in Redwood City and Saint Barnabas School in Long Beach. Still in California, she moved to Saint Catherine by the Sea Convent in Ventura and continued to tutor at Holy Cross School in Ventura until 1994 when she retired. Sister Susanna moved from Saint Catherine by the Sea to Saint Mary’s in 2008 and participated in the Ministry of Prayer. Sister Susanna loved to laugh. She wrote once that one of her hobbies was getting together with friends and just talking and laughing. Her 64 years of friendship in community with Sister M. Luella (Van Dorn) is a testament to their mutual loyalty and support. After a couple of weeks one of the younger children asked her if Sister Joseph Cecile had assigned her to that chair. When she answered yes, the child immediately asked, “What did you do, Sister?” Can’t you hear Sister Susanna laughing because this child thought sister was being punished! Where did that gift of laughter; that spirit of joy and happiness; and that sense of freedom come from? Sister Susanna was a woman of deep faith—a faith that was nourished by her mother. Catherine Collins was a strong woman of deep faith who loved her children. She taught the Collins children how to pray and prayed with them, taught them to respect the dignity of each person and emphasized the importance of being grateful—even if they had oatmeal for breakfast in the morning and oatmeal for supper in the evening! 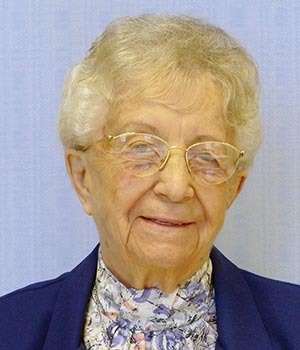 Mrs. Collins was a woman of conviction who made sure her children received a good Catholic education and formation in Catholic schools in living their faith through helping others. When her daughter entered the Congregation, their pastor, Father Leon Bernard, wrote that he was honored to recommend the Collins girl, because of his association with the Collins family for fifteen years. Susanna spoke often of her mother, expressing gratitude for all she gave to her children as each became an adult. Her mother modelled happiness, despite the challenges of raising a family of five during difficult times. Sister Susanna loved her family dearly. Her sisters and brother predeceased her. Niece Bonnie Austin lives in Ojai, California. Bonnie has two children, Joseph and Katie. Katie’s home is with her mother, but she is taking classes at the University of San Francisco to complete her master’s degree and California teaching credential. Joseph lives and works in China. While Susanna was living in Ventura at Saint Catherine by the Sea, she was a great consolation to the family when their father, Pat Austin, died suddenly. Over this Thanksgiving weekend, Bonnie and Katie, distressed that they were unable to travel here for the wake and funeral, dealt with the loss of Sister Susanna by sharing their memories to honor someone so dear to them. “I consider myself incredibly blessed and lucky to have been able to grow up with my great aunt. Every visit was filled with so much laughter, and I will always remember her amazing stories. Whether she was telling you stories from her childhood, from her years of teaching, or stories about her many wonderful friends, she would have you hooked and entertained for hours. Her laugh was contagious and she would put a smile on my face faster than anyone else could. 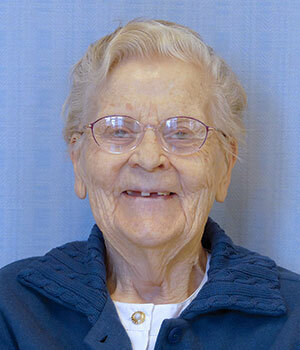 “Sister Susie lived a life full of compassion, perseverance and she gave so much love to others. It is no surprise that everyone who met her immediately loved her and wanted to be her friend. “You were a true inspiration in my life—whether it be during your home visits with Mom and Grandma—my visits with you in San Mateo, Mountain View, Long Beach, Ventura, Ojai and/or South Bend—I always sat right by your side—a “sponge” learning from you through all of your teaching and life experiences. “You, Auntie, reminded me how to count and appreciate all of God’s Blessings and to love unconditionally. You were the one who encouraged me to pursue my dreams—building my confidence to live life to its fullest and trust that God would always be the light—whatever path I chose. “You taught me how important a sense of humor was. Yes, Auntie, you taught all of us how to laugh out loud—although our laughter never quite filled a room as yours did. “I thank God, each and every day, that you were there to see me and Pat married and for the birth of our children—Joseph and Katie. It warmed my heart to see you inspire my children as you did me. You were there for their Baptism, First Holy Communion and Confirmation just as you were there for mine. We were so Blessed. “You were truly one-in-a-million, Auntie. We love you and we miss you but find comfort knowing you are home and at peace. Please join those ‘angels on our shoulders’ as we continue to move forward in life, keeping God in our lives.